WASHINGTON, D.C., September 11, 2012 – The popular agricultural gaming site MyAmericanFarm.org now includes a revised version of the “Farmer's Market Challenge” game, updated to include K-2 learners. The game has been updated to give K-5 grade level students the opportunity to practice essential math skills while learning about food and healthy choices. My American Farm is an interactive game for K-5 graders to learn more about where their food comes from while also being educated in math. The Farmers Market Challenge game, which is aligned to Common Core State Standards for Mathematics, also now includes an "Easy Reader" e-Comic book that takes young readers on a virtual trip to a farmer's market with their friends. 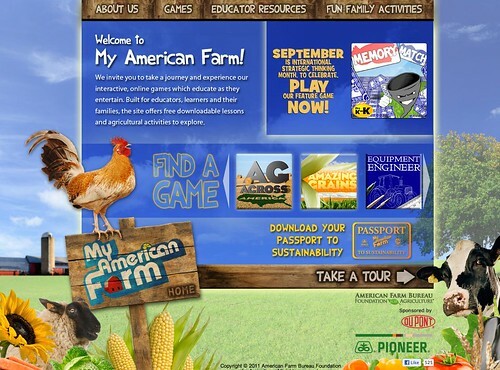 Both the game and e-Comic book can be found at: http://www.myamericanfarm.org/games/farmers_market_challenge/. The site and resources are made possible through the generous support of title sponsor, DuPont Pioneer. The American Farm Bureau Foundation for Agriculture is the 501(c)(3) affiliate of the American Farm Bureau Federation.